HMS Victory coming under fire at Trafalgar. As HMS Victory‘s official log book clearly shows and the Admiralty Committee Report of 1913 agrees, at the moment shown here Victory was steering for the front third, the van of the Combined Fleet. First Shots, detail, click for enlargement. After this moment men of HMS Victory cut away and abandoned her steering (studding) sails. There was no time to take in the sails as would normally have been done. 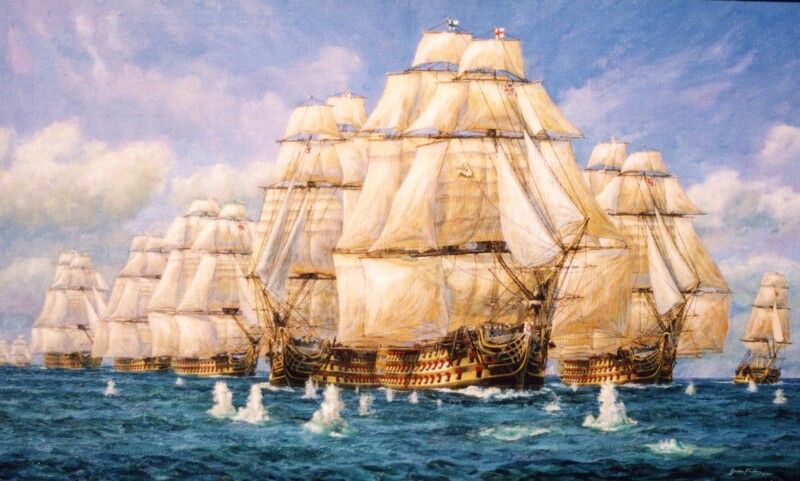 Before Victory reached the line of battle of the combined fleet HMS Victory made a 90 degree turn to starboard to sail down the line of the combined fleet, returning their fire. Nelson’s intention by this ruse was to ‘freeze’, isolate the van of the line of battle of the combined fleet then to cut the line a little above half way, in order to concentrate his ships and their fire power on a small number of opponents and over whelm them before the van could tack (turn back) and support them; while ideally HMS Victory found and attacked the French flagship. Thus His Britanique Majesty’s Ship Victory made a turn to starboard to sail down the Combined Fleet’s line of battle before making a final second 90 degree turn this time to port to break the Combined Fleet line in accordance with the “Nelson Touch” plan. This maneuver very effectively paralyzed the front third of the combined fleet. Their admiral was uncertain, fatally hesitant, exactly as Nelson planned, into remaining on station over long expecting imminent attack. By the time the van were able to tack, further hampered by the very light wind, to respond to their flagships persistent signals to double back and give support; the battle was lost, it was too late. Both sides wanted this fight that became The Battle of Trafalgar.. The French and Spanish fought very bravely, the proof of which was how badly damaged many of the British ships were. The luckless French and Spanish were out Admiral’d, out maneuvered, over whelmed and out fought. Added to their miss fortunes, the British ships were in many ways technically superior (more powerful gun power, flint locks on the guns and many other innovations) and certainly the men better trained. Victory when she reached Gibraltar after the battle had over 650 cannon balls removed from her hull and that does not include those that swept her wrecking most of her upper deck, masts and rigging. Despite the French and Spanish heroism, within two hours Nelson’s ships in that fierce action, had overwhelmed many of the unsupported ships astern of the van and the battle which rumbled on for another 2 and a half hours, was decided. More by luck than judgement Victory took out the opposing flagship. Accounts written by men from both fleets agree the line of battle of the combined fleet was heavily masked by gun smoke. Nelson’s Captain, was Thomas Hardy who’s own account confirms this. When HMS Victory did make her final turn and lunge at the Combined Fleet, more by chance than design, she forced her way through the line directly astern of the doomed French flagship. Victory delivered at pistol shot range a devastating salvo into the unprotected stern of the hapless Beaucenture, raking at such close distance that the French ensign brushed the Victory. Some accounts say that one blast killed 400 brave men and wrecked the beautiful 80 gun Beaucenture. Napoleon who denied the significance of Trafalgar famously said, “don’t give me a good general give me a lucky one” – Nelson was both. Less lucky for Nelson, next astern of the flag was Redoutable, Captain Lucas. Victory could not have picked a tougher opponent out of the entire fleet. The Redoutable men almost cleared the upper deck of Victory, even briefly boarded Victory and it was a shot from her mizzen top that ended the career and life of Horatio Nelson, see the study for “The Death Of Nelson, a French marksman’s view”. It took the assistance of the 98 gun ‘Fighting Temaraire‘ to finally subdue the survivors aboard the Redoubtable. Gordon Frickers has worked on the Nelson story since 1995, produced much original research. His work appears in several authoritative books including one by Dr Sam Willis and 2 of the books by Peter Goodwin Keeper and Curator of HMS Victory and Gordon Frickers has given a series of 10 illustrated, interactive, evening talks on the subject of Nelson, a role model. Some of his many sources are listed below, profit, enjoy. 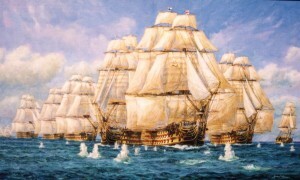 HMS Victory, Trafalgar, ranging shots begin to reach her. Marine art by Gordon Frickers this painting measures 76 x 121 cms (30″ x 48″), oils, available. 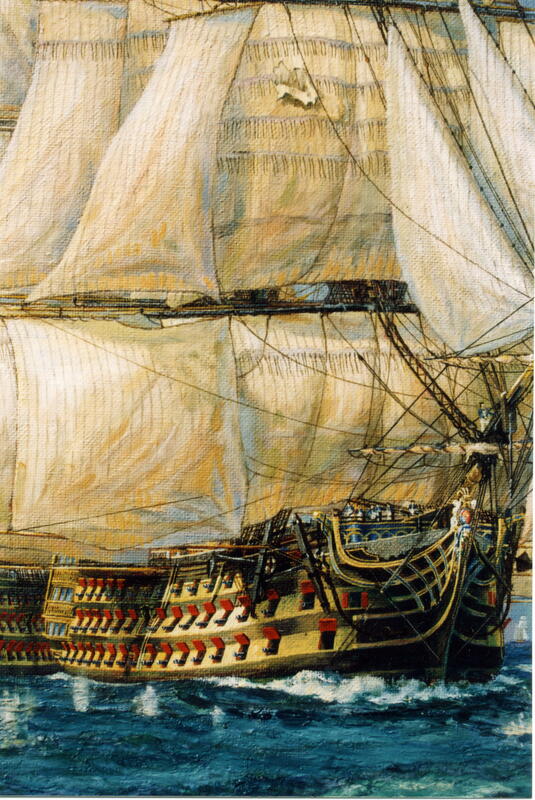 Frequent visits to the ship HMS Victory and often listed on ‘Daily Orders’. The original fore topsail of HMS Victory, preserved under the guidance of Mr. Peter Goodwin.